In memory of Leonard Nimoy, who played Spock in the Star Trek tv show and who died on Friday, I have interrupted our read through of the Deep Space 9 books to bring you the story of Spock’s first voyage on the Enterprise. It is also my first encounter with Spock, or any Vulcan, so the story was full of interest to me. I should add, before we start, that I finished this book at 2am in the morning in an uncharacteristic fit of insomnia, and I’ve just done a day’s work on three hours sleep, so this review may not be coherent and may not have grammar and it may not really accurately reflect the book. So, really, you are probably best off finding another review, or just reading it yourself, but if you do really want to know what I thought then read away! BUT THEN the Enterprise sets off on a mission to find a missing Vulcan heirloom. They smuggle it aboard but then the person looking after it is killed and the stone is stolen. What’s that you say? A Star Trek story with an unknown killer on the loose? Surely not! They know the killer is a Vulcan so they lock them all up except for Spock and his fancy-woman who were canoodling at the time and so have alibis. So, as he wasn’t under suspicion, Spock is sent down to some planet with Captain Pike on an errand that seemed, frankly, spurious while his fancy-woman stays aboard and joins in the murder investigation. Pike and Spock solve the mystery – or whatever it was they were there for – on the planet by setting up a market (???) and beam aboard only to find that Spock’s pretty bit of Vulcan has been the next victim!! Lawks! 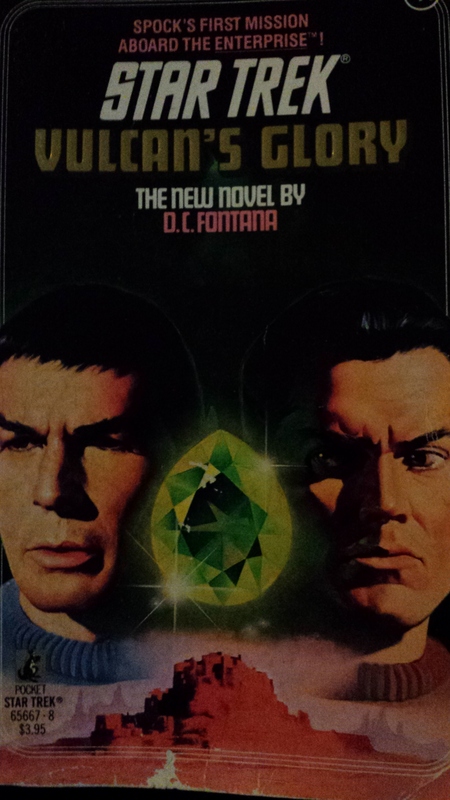 Spock gets exceptionally cross, in a repressed Vulcan way, and uses his super computer skills to find the killer, solve the mystery and end the book. Hurrah for Spock. Unfortunately, it seems that part of him has died inside, which is a shame as we had only just got to know him and he really is a bit of a sweetie. Meanwhile, there is a whole other subplot involving Scotty, some gamma rays and space station hooch. I think this is mostly in there so we can say ‘hooch’ a lot. Hooch-hooch! HOOCH! Or maybe it was plonk? My favourite bit of this book was when they explained how warp speed was achieved. The basic operating principle of the matter-antimatter engines of a starship was relatively simple, as so many brilliant ideas are. A dilithium crystal was suspended in the centre of the injector core and subjected to a carefully directed stream of matter from the top of the core and one of antimatter from the bottom. The planes of the faceted crystal absorbed the two streams of matter that were deadly to each other and redirected them into a compatible river of material that produced warp power for the engines. I think I’m going to track down a dilithium crystal and build one at home. Tags: book, book review, books, Hooch, Spock, Star Trek, Starship Enterprise. Bookmark the permalink. Previous post ← Well, that was February! What do you mean ‘ may not have grammar’? You better not let your father see that! I will diplomatically not answer that rhetorical question. Ah! At last. Now I understand.